Over a five year period, the Atlantic Ocean Tropical Tuna Tagging Program (AOTTP) aims to partner with scientists and commercial and recreational tuna fishermen to tag at least 120,000 tropical tuna with conventional and/or electronic tags throughout the Atlantic. The Atlantic Ocean Tropical Tuna Tagging Program was established by the International Commission for the Conservation of Atlantic Tunas (ICCAT) in 2015 to study key aspects of bigeye, skipjack, and yellowfin tuna life history and movements in the Atlantic Ocean. The data generated from these tags will be essential in improving understanding of these important species, which will enhance fisheries management and promote sustainability of the stocks. Given the status of the stocks, data on tropical tunas are desperately needed to preserve fishing opportunities in the western North Atlantic. As part of the AOTTP, Dr. Walt Golet from the University of Maine and the Gulf of Maine Research Institute will be working with colleagues at the New England Aquarium, University of Massachusetts Dartmouth, Massachusetts Division of Marine Fisheries, University of Miami, and NOAA Fisheries to deploy 5,000 conventional tags on bigeye, skipjack, and yellowfin tuna in the western North Atlantic from Canada to Venezuela, including the Gulf of Mexico and the Caribbean. AOTTP project researchers are seeking volunteer anglers to tag bigeye, skipjack, and yellowfin tuna. 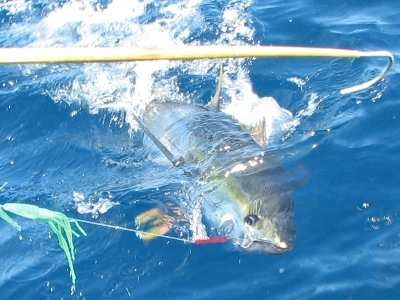 Upon signup, anglers will receive all the necessary information, instructions, and materials to start tagging tuna. Tagging tuna will allow fishermen to become involved in important scientific research. In addition, participants will have a chance to win one of 20 individual cash prizes totaling more than $39,000 US dollars that will be awarded at the end of the project.